"MUSKOKA’S CALL ECHOES AS AUTUMN APPROACHES"
A cacophony of colour, bodies of water that sparkle in the sunlight, verdant green hills and the aroma of firewood smoke dancing in the wind – Muskoka welcomes you to an autumn getaway that demonstrates why the Group of Seven artists chose to reflect its beauty in many of their works. Huntsville proudly displays favourite son’s Tom Thomson’s statue downtown on its fun main drag, with restaurants, brew pubs and boutiques adjacent to the Muskoka River. If you’re an art fan, this is a must-see stop on your northern tour. One of the area’s first traditional lodges, the Deerhurst Resort was established in 1896 and while none of its original buildings stand, it still has the genteel aura of the early 1900s when it was at its heyday and invited visitors to transit the waterways from Huntsville by steamship to enjoy a relaxing holiday. The hotel itself has 330 rooms and has year-round fun options. In the summer, the lake, two outdoor pools and kid-friendly activities welcome families. Spring invites visitors with maple syruping and tree-top trekking (opens in May). Winter is spectacular with an ice skating trail at nearby Arrowhead Provincial Park and on-site snowmobiling. Year-round escape room cabins, trail riding and the indoor pool offer a wide range of entertainment. But fall is a favourite time to visit as the colours beckon, the golf courses are less busy than in summer, there are fewer bugs so hiking, biking and walking are excellent. A walk around Peninsula Lake provides time to reflect during this time away. You can make golf part of your Deerhurst holiday for free because you get a round of golf included with your accommodations with the Stay & Play packages. Fall golf packages have enhanced savings, especially midweek. Deerhurst Resort has grown and hosts guests in 26 buildings of several configurations, both hotel rooms and condos. In some you can sleep like a political super star in a room once occupied by Angela Merkel or Barak Obama. The Summit Lodges were named thusly during the G8 Summit there in 2010. Hotel rooms in two buildings house two adults and up to two minor children (who stay for free) in rooms that feature king size beds or two queens. Deerhurst is the perfect setting for a romantic couple’s getaway but if you’re thinking of bringing the kids and grandkids, several condo buildings, with one-, two-, and three-bedroom suites are available to rent in all four seasons. The newest is Lakeside Lodge which is nearing completion at writing and is scheduled to open later this year. When it’s time to recover from all that trekking and you’re done with the golf course, the spa awaits with services for him, her or couples. The on-site restaurants offer great food and entertainment. The Compass Bar and Grill has a patio and local troubadours serenade diners on Friday and Saturday nights from 8:30 into the evening. Try the chicken supreme at this eatery. The Maple Pub and Patio overlooks the Highland Golf Course and features draught beer from local crafter Muskoka Brewery. There’s one made especially for Deerhurst but try the Cool as a Cuke for a deliciously different taste. The Eclipse dining room features a Sunday brunch buffet that is not to be missed and there’s no bad seat in the house with sweeping views of much of the resort’s property. Deerhurst Resort also hosts bigger name entertainers, like country star Brett Kissel in October. 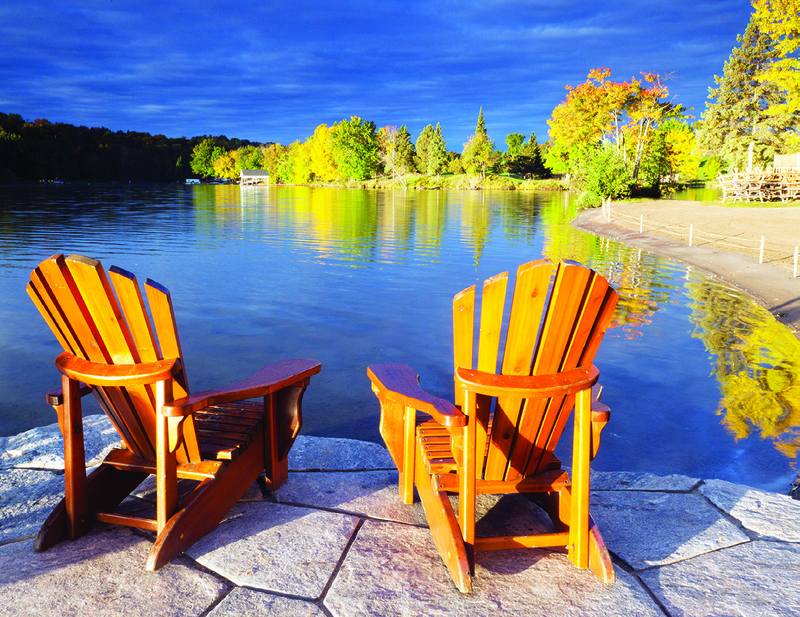 When the colours call, head north to Muskoka and Deerhurst Resort for a romantic getaway that provides a full menu for the senses. Subscribe to receive an online copy of each issue.